2016 Rossignol Experience 88 ski review. OnTheSnow tested this ski as part of its men’s All-Mountain Front Category. “Wicked edge hold,” says Gaudet of the Experience 88. “It’s stable, predictable and playful.” Other testers agree with Gaudet’s sentiment, which is why the 88-mm-waisted ski scored among the highest in the category for carving, with lowest scores for float. 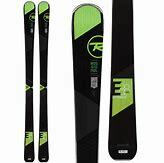 Construction includes Rossignol’s Air Tip technology (honeycomb “air” pockets in the tip originally used for swing weight reduction in freeride skis) and a sandwich laminate makeup that combines wood and lightweight basalt. Tip and tail rocker are added for maneuverability, while Rossignol’s Extended Sidecut continues beyond the contact point where the rocker starts, allowing edges to engage more as edge angles increase. “Only at full speed does the large tip feel squirrely; otherwise this ski is the right width and right sidecut for all-mountain goodness,” says Smid.